Follow the three steps necessary to sharpen a chisel or similar tool with a grinding wheel. I’ve never seen the guy so angry: His wife used a favorite chisel to open a paint can and my friend Dominick took it personally. The big nick in the edge of that chisel was, well, just about criminal in his eyes. Ordinarily, a chisel or plane iron needs little more than an occasional honing on a water- or oilstone – unless, of course, it’s been abused. A nick or other significant imperfection in its edge as the result of an encounter with a nail (or a paint can) or another tool will mean a more difficult sharpening job. The bench grinder is the tool of choice for such tasks. 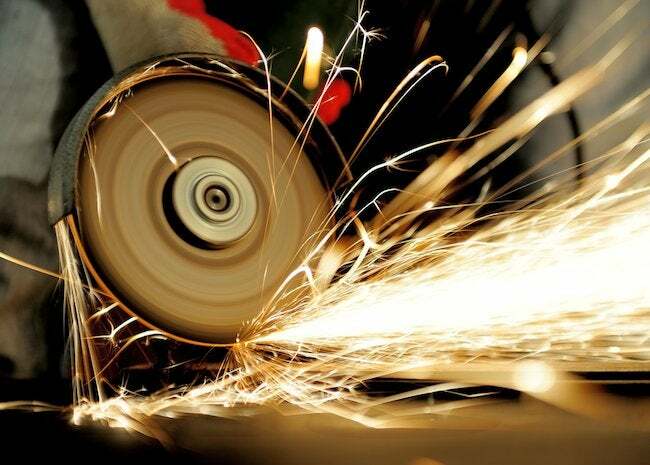 One advantage the grinding wheel has is speed: It’s quicker than using a coarse whetstone. Another is its shape: The tiny arc the wheel grinds into the tool is a hollow-grind, which means that the tool is likely to retain its sharpness for many honings. To return a tool to usability, three steps are required to sharpen a chisel or a plane iron. speed, gently but firmly slide the chisel back and forth across the wheel. 2. Grind the Bevel. Matching the original angle ground onto the edge is essential (note that the angle varies from tool to tool). One way to transfer the angle from the tool to the grinder is by using a bevel gauge to set the tool rest to the right angle. Another option is to use a grinding attachment that is set at the proper angle. Now, with goggles on and your machine at full speed, move the blade back and forth across the wheel. Do it gently. And don’t forget to bathe the tip of the tool in a water or oil bath. A blade that has been allowed to get blue hot loses its “tem­per,” namely, the hardness or resiliency of its manufacture. In practice, the loss of temper means the tools will not hold a sharp edge, dulling quickly with minimal use. So dip the blade frequently in a water or machine oil bath while grinding. 3. Hone the Tool. Now that the shape of the tool has been re­stored, hone it on a oil- or waterstone. Squaring a Driver Edge. A chipped or rough-edged screw­driver is easily sharpened on a bench grinder. The steps are the reverse of those for a chisel. Start by grinding the broad, flat edges of the driver tip, holding the shaft of the driver so that it is tangential to the blade. This grinds a slight convex curve into the tool (again, a “hollow grind”). After hollow grinding, reset the tool rest so that the shaft of the tool points at the center of the wheel. Grind the tip square, gently by firmly sliding the tip back and forth across the flat edge of the wheel. In talking grinding, there are three key words that will help you get what you want. Grain Size. The “grain size” of that grit identifies whether the wheel is coarse, medium, fine, or some gradation in between. The larger the grain, the coarser the wheel. Grade. The hardness of the bond between the grains of grit determines the hardness of the wheel. Hard wheels are used for grinding soft materi­als, and soft wheels for harder materials.